As with all tattoos, cat tattoos became common as people wanted to have them for the different symbolism they served. Depending on the culture, cat tattoos were used for luck, spirituality, endearment and many more. 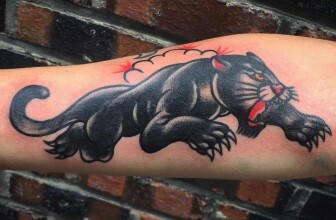 Cat tattoos are just as old as the art of tattooing. Depending on the sentiment one attached to cats, they would get a cat tattoo for that reason. 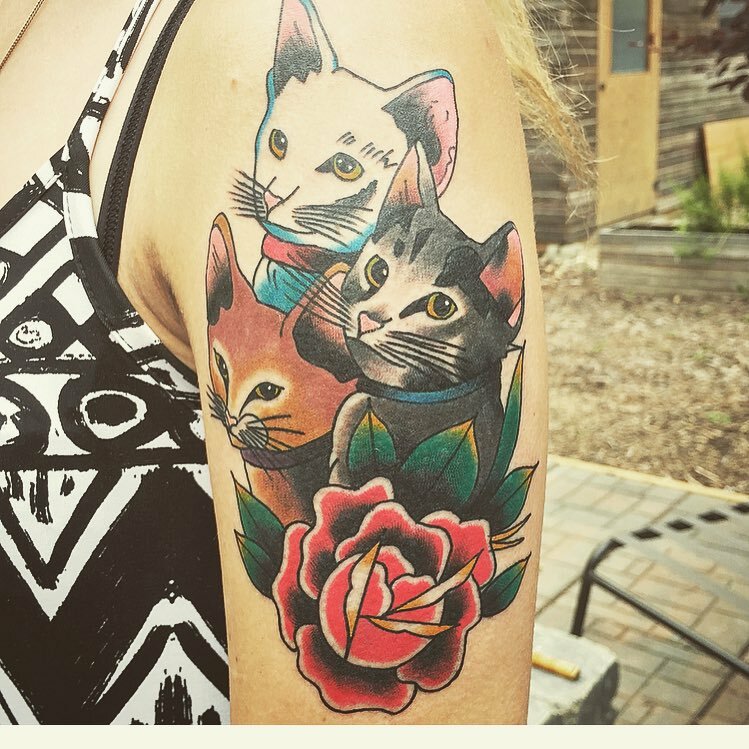 Tattoos, in general, are a way of expressing oneself through art, so cat tattoos were used as a form of expression, in some cases it helped to identify some people as the kind of tattoo one got would give an insight into their personality. To be able to understand the history of cat tattoos, you need to first know the relationship between cats and humans. Cats and humans have lived together for thousands of years. It is believed that in the first century, humans domesticated cats to catch mice that used to raid the food stores. In Ancient Egypt and many other ancient civilisations, cats were also seen as being spiritual. Ancient art depicts the cat as a revered animal. They also were considered to bring luck and at times bad luck. The name cat actually comes from Egypt where the cat was believed to be the extension of the moon goddess. In Egypt, cats were worshiped just as much as they were loved. As said before, cat tattoos serve different sentiments so the meanings of cat tattoos are varied. Cat tattoo meanings depend greatly on the culture of the owner of that tattoo. Cats are believed to be a bridge between the world of the living and that of the dead, they are believed to have the ability to travel and communicate between both worlds. elegance and refinement and cuteness. It all comes down to the type of cat tattoo that you get which will determine the meaning of the tattoo. Here are some of the types of cat tattoos. There is a lot of folklore attached to the black cat, in Europe black cats were the companions of witches and believed to have supernatural power, they were feared and respected at the same time. Other cultures sacrificed black cats to ward off bad luck. When it is used as a tattoo however, it is associated with mystery, unknown strength and feminism. The most outstanding feature on a black cat tattoo is usually the eyes that look enchanting and beautiful. Some people would just like to have the paw of the cat usually with the claws drawn out. This is common in Asian art as it symbolises prosperity and good fortune. The cat paw is also a symbol of inner strength or physical power especially when it has the claws out. One of the most preferred places for this tattoo is the arm around the shoulder area. Some women also like to get this on the back. The winged cat tattoo dates back to ancient civilisation where cats were worshiped and believed to be messengers between humans and the spirit world. One could opt to have just one cat seated with its wings opened or they could have 3 winged cats in motion – these ones are usually on the arm and they are drawn moving up the arm, this is to signify that the cats are able to fly up to the heavens as they are messengers. Sometimes this tattoo is also used to remember a departed loved one who is believed to be in the afterlife. 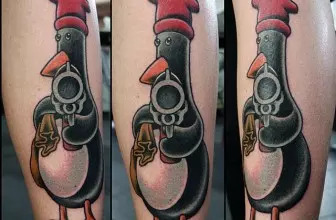 This tattoo is beautiful and yet intimidating at the same time. Cats are known to have eyes that can glow in the dark and they are colourful. The cat eyes tattoo just portrays the eyes of the cat, mixing different colours like blue, green, yellow and black to make it seem like a cat is staring at you. 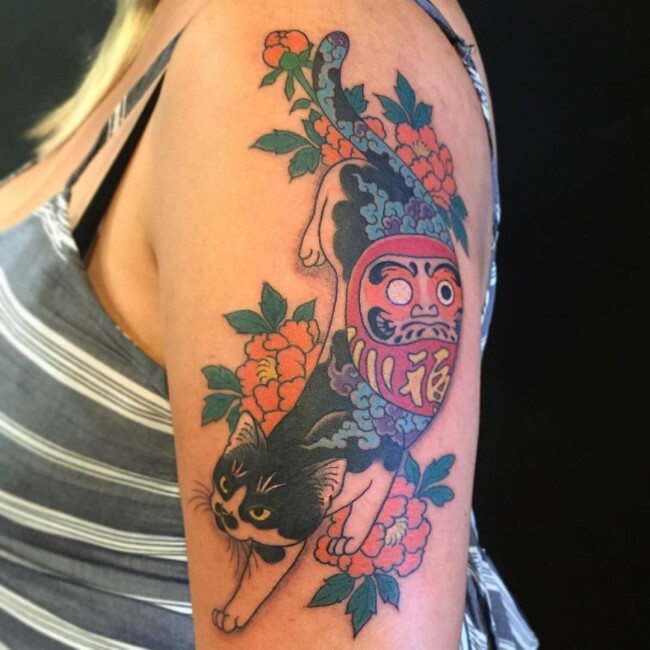 This tattoo is associated with protection – in ancient times, cats were believed to watch over humans so this tattoo was made to provide protection to the person wearing it. This tattoo appeals to people who may have gone through a tough time and feel they need protection from their past. 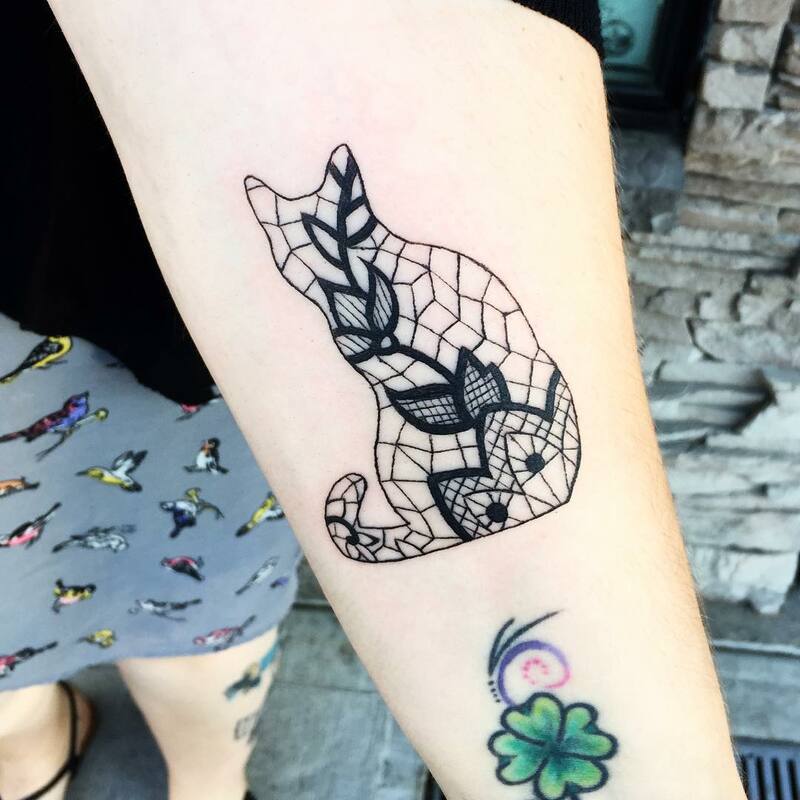 Cats are furry and cute and some tattoos depict this nature of the cat, it could be a playful kitten with a smile on its face, it could be just a nice warm cat face or a combination of cute things like a cat snuggled up in a basket with a flower and a butterfly. 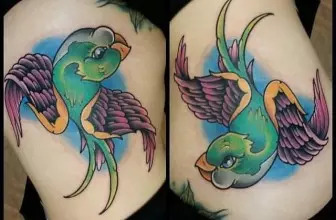 People who get this tattoo usually tend to be soft hearted and cute while others are cat lovers and like to have a nice tattoo of their favourite animal on them. It is a reflection of their personality. One of the most common cartoon cat tattoos is the one of Garfield, the cartoon character who is funny witty and lazy too, but loved by many. There are other cartoon characters that are made into tattoos like Tom from Tom and Jerry or Sylvester the cat. This combines a person’s love for cats as well as their love for cartoons. It is a more modern trend common among young and old exhibiting their playful side. 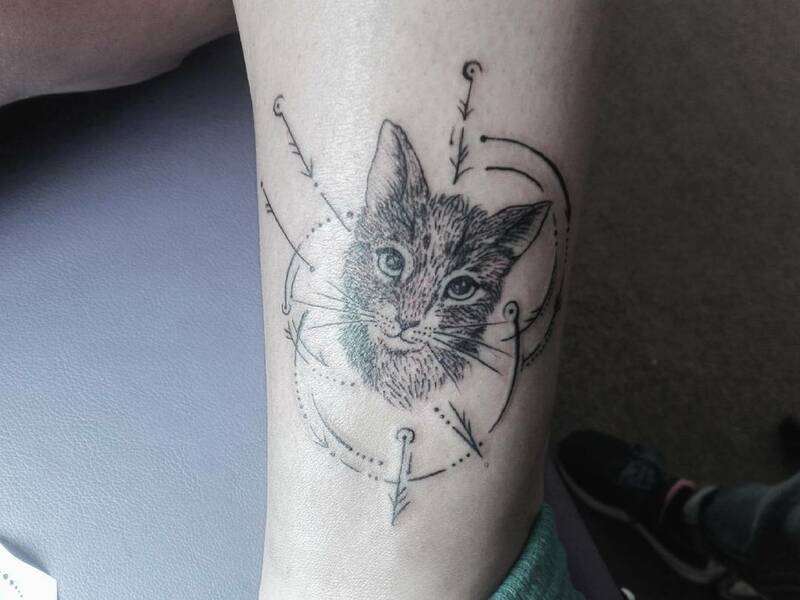 This just concentrates on the face of the cat, quite commonly cat owners choose this one to get a tattoo of their cat, it could be a cat that just died and they wish to remember it or they just want to have the face of their pet on their body. Attention is paid to detail when drawing this tattoo to ensure that the tattoo looks every bit like the cat it is supposed to depict. Cat tattoos usually are associated with the characteristics of a cat for example a cat is said to always land on its feet, or it has 9 lives, it is proud, it is mysterious and so on. Some tattoos are made to show this characteristic, say, a cat falling, to show that it will land on its feet. This appeals to people with cat like characteristics or who are motivated by cat qualities. Whatever design you choose, it should reflect something you value and portray the same message. It’s fun, though, sometimes when you get some ambiguous tattoo that will leave people guessing. So try and explore with your taste, and come up with something different that’s going to really stand out. That’s what art is all about.